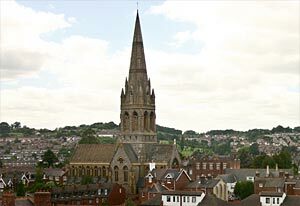 With its high position on Mount Dinham, St Michael's is a prominent landmark from most areas of north west Exeter – and so it should be, as it possesses the highest spire at 70 m (230 ft) west of Salisbury. The spire contains a single bell weighing 26 cwt including the frame work, tuned to E. The church is built on land donated by the philanthropist John Dinham who leant his name to the area. He built almshouses for the poor and planned a school on his land, as well as a chapel. He decided to purchase the land as it was frequently used for fairs which he felt were posing a moral danger to the young. 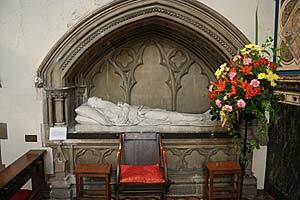 After Dinham's death in June 1864, The Revd. Joseph Theophilus Toye the incumbent of St David's suggested building a church in his memory, at a meeting that planned to honour Dinham with a statue. 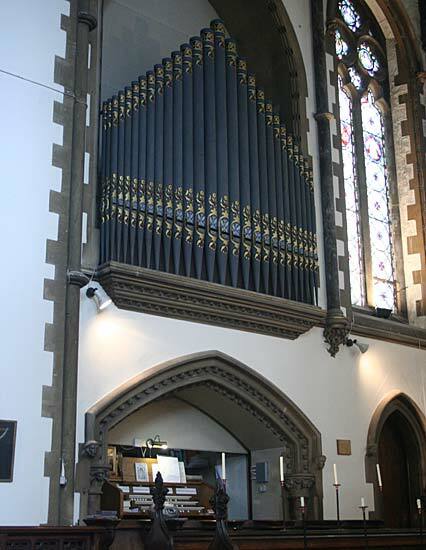 Having strong Tractarian beliefs, he approached William Gibbs of Tyntesfield for funding, and built a rather grander neo-gothic Anglo-Catholic church, at a cost of £21,000, than Dinham originally intended. The vicar was left an endowment of £70 per annum which proved to be inadequate in future years. William Gibbs had spent time at Cleve House in Exwick as a child, and his father, Anthony Gibbs built the woollen mill and factory in 1787 in the village, in partnership with Samuel Banfill and Edmund Granger, and then, after about a year, managed to bankrupt himself and his father for combined £40,000. William Gibbs took over his father's merchant business, Anthony Gibbs and Son, in London and made his fortune importing guano as fertiliser in the mid nineteenth-century, enabling him, after more than fifty years to pay off the family debts. He was particularly noted for his church building including the enlargement of St Andrew's Church in Exwick, purchasing the living for his nephew, WIlliam Cobham Gibbs..
St Michael's was designed by Major Rhode-Hawkins in the Decorated style, and built between 1865 and 1868. Constructed of blue Westleigh stone by William White of Vauxhall, London, with dressings of Ham Hill stone. The extensive carvings were executed by Hurley of Taunton. Over the door at the western end is a carving representing St Michael overcoming Satan. The church was consecrated by the Revd. John Medley, Bishop of Fredericton, Canada on 29th September 1868, Michaelmas Day. The collection for the two services on the first day amounted to £175 5s 4d, indicating that the congregations were quite wealthy – not the sort of sum that would have been collected at St Edmund's or St George's in the West Quarter. It was equipped with the latest gas lighting and could seat 700. The interior is surprisingly high, at 65 ft, while the pulpit was carved from English oak, from a design by Sir Arthur William Blomfield, and carved by Harry Hems of Longbrook Street. In 1883 the chancel was decorated with wall paintings, roof decoration and some stained glass, along with a recumbent figure of William Gibbs by H Armstead RA. 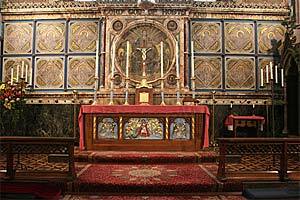 Further mosaics and mastic decorations to the reredos added in 1899 by W D Caroe, who was the architect for St David's Church. 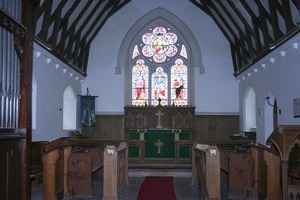 The stained glass at the east and west ends and in the chancel's side windows is by Ward and Hughes of Soho. Initially, men and women were segregated, with men on the north side, and women on the south. This practice led to a correspondence in the Flying Post with one letter writer stating that the church had acquired the nomenclature of the "Divorce Court." The church also received a fair amount of criticism for the High Church form of its services, and some not liking what they considered to be 'ritualism' which was driving away Protestantism. Music was an important part of the liturgy. 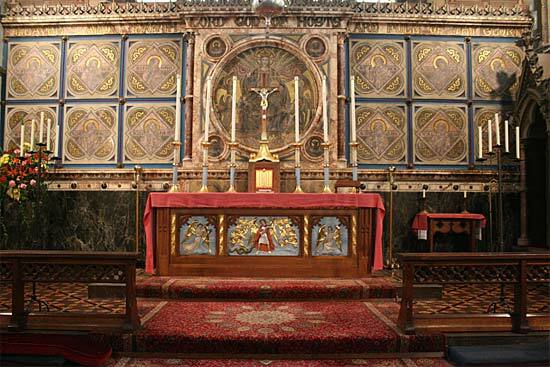 Gradually, the church became more Anglo-Catholic with side chapels and shrines within the transept. The Lady Chapel became a war memorial in 1919. 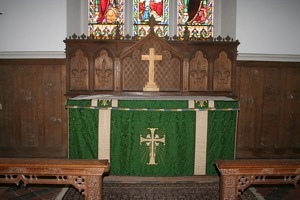 The present High Altar, cross and candlesticks were carved in the 1960s by Herbert Read Ltd. The firm never put a mark on its work, believing the quality would indicate it was from their workshops. 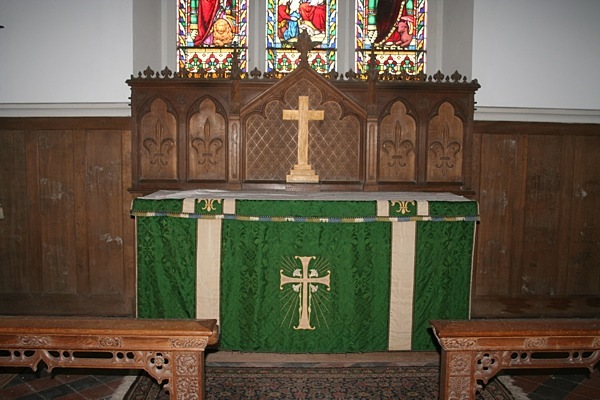 The former altar was moved to St Clements Chapel in the north transept. During the Second World War the church was used for many concerts as it was possible to achieve a complete blackout in the space. St Davids and St Michael's are now served by a single priest. A single peregrine falcon took up residence, in 1987, on the tower, and a year later, it was joined by its mate. I was not until 1997 that breeding was first observed, when the pair moved into a former ravens nest 30 meters above the ground, and raised a brood of three juveniles. The raven's nest disintegrated after some remedial building work, so a shallow tray was built by the Devon Birdwatching and Preservation Society. During 1999, Eco-Watch Ltd designed and installed a camera to film the birds, and in 2005 it was linked to the Royal Albert Memorial Museum in Queen Street by wireless. The best time to observe the birds is May through to July as the young grow and become active. Between 1997 and 2005 the birds have raised 30 young. While St. Michaels was being built William Gibbs was also approached by Rev. 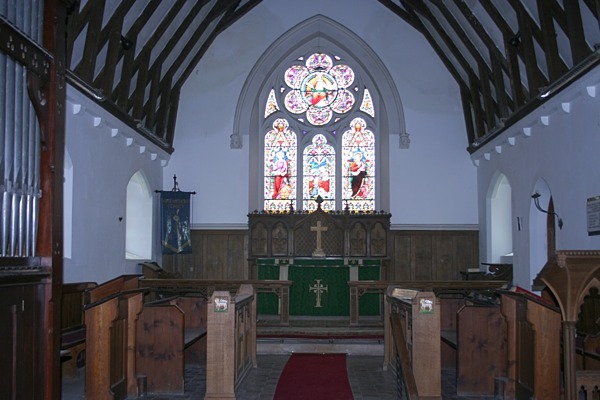 Kindersley of Brampford Speke for assistance in building a Chapel at ease in Cowley, a hamlet that was over two miles from Brampford Speke church. Joseph Sheppard of Cowley Place had allowed the local people to use his lounge for worship, but when he died in 1865 his daughters donated a small parcel of land out of his estate for a Chapel, before the rest of the estate was sold for £6000, a large sum of money at that time. William Gibbs parents had lived in Cowley before they went to London in 1808 and founded Antony Gibbs and Co. the business that made William Gibbs his fortune. He agreed to fund the construction so long as £2000 could be raised to allow for the appointment of a Curate. This took time with William donating the final £200. Major Rhode-Hawkins, who was in charge of the building of St. Michaels, was appointed architect and the foundation stone was laid on 28 August 1867. Work proceeded quickly with the Chapel being consecrated on 4 May 1868, some months before St. Michaels. It was dedicated to St. Antony of Egypt a 4th century desert hermit Due to changing circumstances the last service in the Chapel was held in September 2011 and the building put up for sale. Sources: St Michael's website, Kelly's 1897, Flying Post, Robert Clark web page on single bell churches, notes by Richard Parker, leaflet on the peregrine falcons by Nick Dixon and other miscellaneous sources.Cowley Chapel paragraph researched and written by Julia Sharp.